Christy: I’m a hopeless romantic writer, inspired by art, love and hope. I’ve always been a creative person. I just might be the only writer out there that doesn’t drink caffeine. Dark chocolate and warm cookies are my weaknesses. 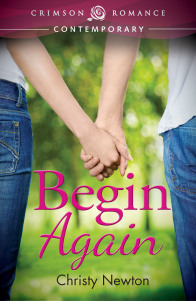 Christy: Begin Again is a sweet contemporary romance. Think Hallmark movie. Christy: One day, I thought, what if a young woman lost everything? Her husband, her child and her home. How would she ever get over such a big loss? Then a hero popped into my head. He’d have to be genuine and sweet and patient but persistent. There were lots of tears while writing this book happy and sad. Begin Again was a story I truly wrote from the heart. Christy: Hmm, like asking a mother to pick her favorite child. If I had to pick today it would be Begin Again, but please check out my romantic suspense books, too! Christy: Maisie, I can relate to her. As she walked outside carrying the pie wrapped in foil, she looked up. I’m sorry, Luke, but I have to try to move on. A ladybug landed on her hand. She smiled and it flew off. Ladybugs were the only bugs she didn’t mind. In fact, Luke had once called her ladybug when they’d first met. Maybe it was a sign. She placed the warm pie carefully in the passenger side seat and then hopped into the driver’s seat. Warm from the heat of the inside of the car, she cracked all four windows to let the air circulate. She could picture eating pie on Ryan’s deck and laughing and kissing. She sighed, happily just thinking about his sweet lips on hers.